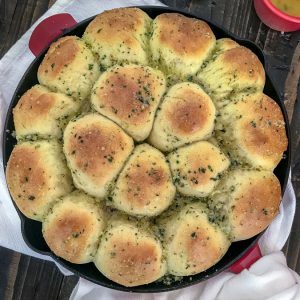 Garlic Parmesan Skillet Rolls – homemade bread dough that is baked in an iron skillet until soft, fluffy, golden perfection and then topped with an incredibly easy and delicious garlic butter and parmesan cheese coating. Very easy to make, flavorful, and sure to be a crowd pleaser! This has become one of my favorite side dishes to accompany just about any meal. Especially soups or sauce-filled dishes, because bread is so good at dipping and soaking up these delicious flavors. 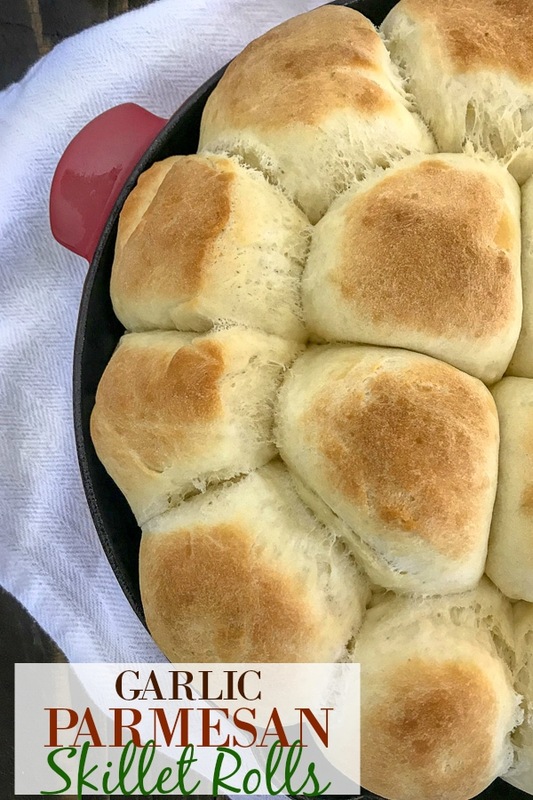 With Thanksgiving right around the corner, this is the perfect dinner roll to serve to your family or friends! You can serve it with the garlic-herb butter and parmesan as pictured above or without, as you see pictured below. I promise they are good either way, as I have made them with and without the garlic parmesan topping. 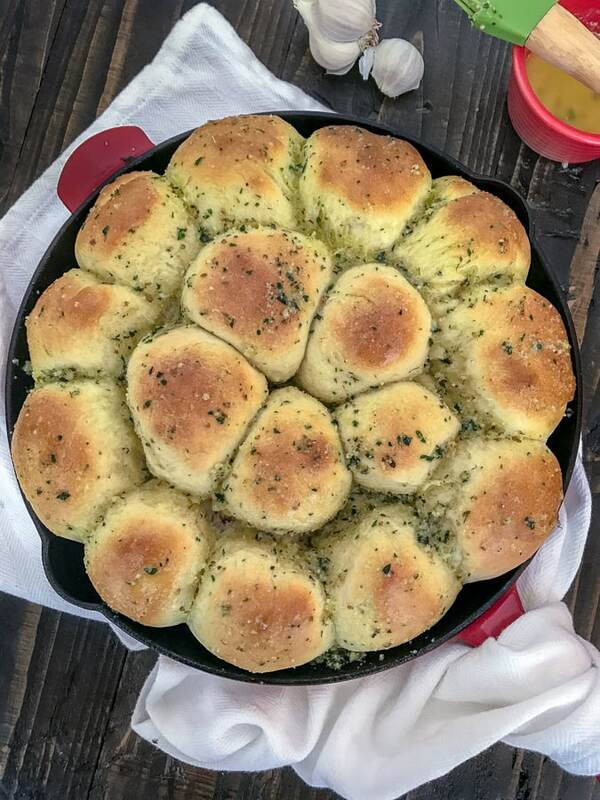 The garlic-herb butter and parmesan combination just takes the rolls to a whole new level of flavor. Every single soft, fluffy bite is full of garlicky flavor. You will have a hard time stopping at just one! This Garlic Parmesan Skillet Rolls are the perfect pairing for Crispy Parmesan Chicken Meatballs, Crispy Baked Chicken Parmesan Zoodle Bowls, Creamy Cilantro Lime Chicken, or my Super Tender Instant Pot Pot Roast. But what about the upcoming holidays? Yep! I served these for an early Friendsgiving Day Spread that we had with friends this year and they were a hit all around the table. No one could believe they were homemade and every last roll was devoured either with cranberry sauce or to wipe up any leftover gravy from my Easy Tender Instant Pot Turkey Breast! Which makes us foodies very happy. So make these for your upcoming Friendsgiving Day Spread, Thanksgiving with loved ones, or even for your Christmas get togethers. I promise they will be loved all around! 10″ Enameled Cast Iron Skillet – This cast iron has worked like a charm for me for years. You won’t need the lid for this recipe. But I do recommend this one or one similar. Doesn’t need to be red ;-), I just love the color. Pyrex 4-Piece Glass Measuring Cups – These measuring cups work like a dandy when it comes to combining liquids to make sauces, broths, whisking, pouring, etc. 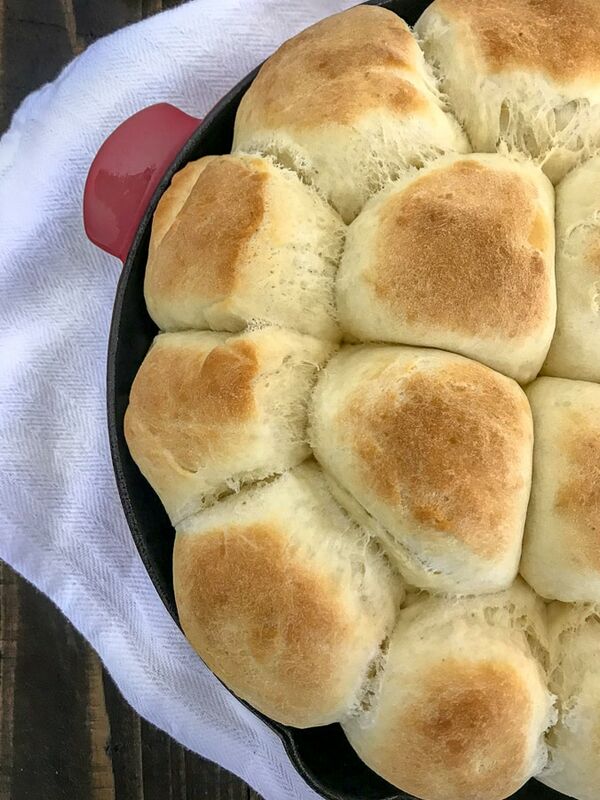 Fleischmann’s Rapid Rise Instant Yeast – This is the exact yeast that I used for this Garlic Parmesan Skillet Rolls recipe, as well as my Pumpkin Cinnamon Rolls with Cream Cheese Frosting recipe. Works like a charm every time! Especially when you don’t care to wait all day for the dough to rise! MORE DELICIOUS SIDE DISHES TO TRY! Maple Roasted Carrots – Very easy and delicious recipe if you’re looking for a vegetable side dish. Roasted to fork tender perfection with a hint of sweet, maple flavoring. Creamy Mashed Sweet Potatoes – A lightened up, subtly sweet version of the traditional Thanksgiving mashed sweet potatoes! Creamy, fluffy perfection in under 20 minutes. Cheesy Broccoli Ham Casserole – This dish works great for any leftover ham or turkey from the holidays! Creamy homemade cheddar cheese sauce, broccoli, and ham with the most delicious crispy parmesan cracker topping. Comes together in no time and is sure to be a hit with your family. Garlic Parmesan Mashed Cauliflower – Looking for a healthier substitution to traditional mashed potatoes? Then this is the recipe for you to try! Tastes just like potatoes, but is made with cauliflower instead! Cucumber Avocado Corn Salad – An easy, vegetable packed salad that comes together in minutes and is a great, light side dish for any meal. 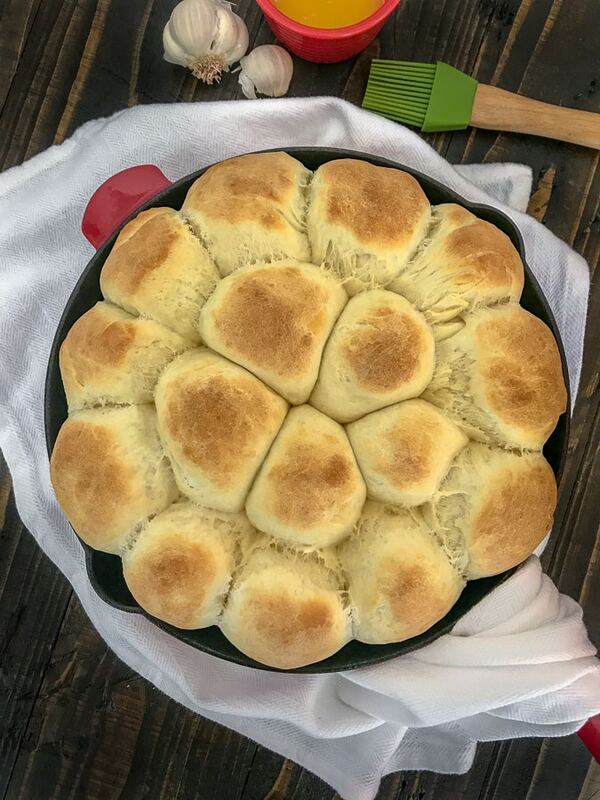 Soft, fluffy and delicious rolls made from scratch baked to perfection and topped with a garlic, butter, and parmesan mixture. Perfect side dish for any occasion! To a 2 cup (or larger) glass measuring cup or mixing bowl, combine the warmed water (to 110-115 degrees F, read the label on the package of yeast to confirm temperature) with the yeast and then the sugar. Whisk thoroughly. Combine remaining dough ingredients into a mixer with a dough hook. Pour the yeast mixture into the mixing bowl. Run the dough hook (or mix/knead by hand) for 5-7 minutes, or knead until a large ball of dough has formed. Remove any dough from the hook, cover the mixing bowl with plastic wrap or a towel to rise for 10-15 minutes. While you're waiting on the dough to rise, preheat oven to 375 degrees F. Spray a 10-inch cast iron skillet with nonstick cooking spray. If you don't have a skillet, you can use a circular 9" baking pan or dish. Divide the dough into 16 even balls. I found it easiest and best to flour my counter lightly and roll the dough out to 12" by 12" and cut into 16 even slices. Three slices along the dough horizontally and three slices vertically. Roll each slice into a ball with the palms of your hands and place into the skillet. Prepare the garlic-herb butter sauce by combining the butter, garlic powder, parsley, and oregano. Brush the mixture over the tops and sides of each roll. Sprinkle with parmesan cheese. 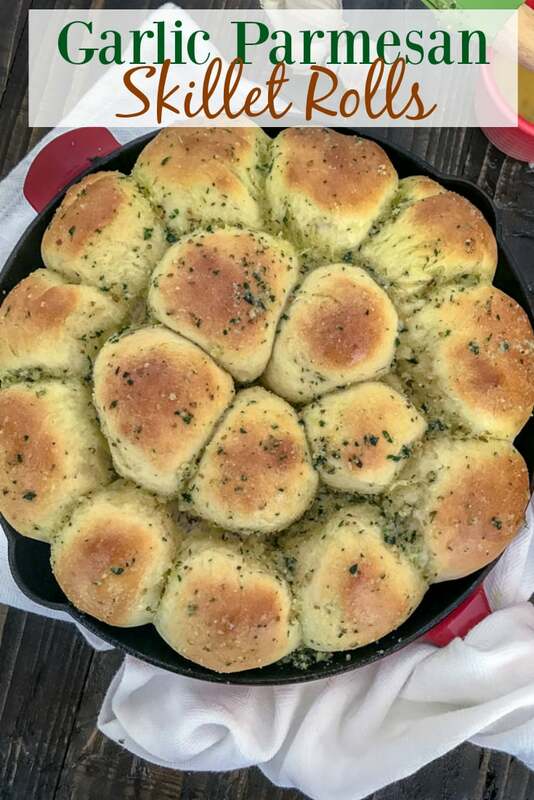 You can also bake these rolls without the garlic-herb butter and parmesan or brush it over the top after the come out of the oven. Bake for 15-20 minutes or until the tops have reached a light, golden brown. Brush remaining butter mixture over the tops and serve warm. You can make as many rolls out of this, larger or smaller, as you would like. This recipe makes rolls on the smaller side. Eight balls would make eight large rolls. Or you can make the balls even smaller and make bite size rolls out of it.